BLYTH, ON – Cowbell Brewing has announced details of a special limited edition beer that has been released to mark the brewery’s 1st anniversary. Almanac 2018 is a rich, full-bodied and gorgeous Barleywine. The beer was brewed with eight malts, Demerara brown sugar, and Dark Belgian Candi Syrup. It has been matured for an entire year, left unfiltered and unpasteurized, and will continue to mature and evolve for 10 years or more in the bottle. It resembles the type of complexity and depth typically reserved for port and spirits, offering notes of toffee, dark fruit and vanilla, and is best enjoyed with family and friends. Of the 100 hectolitre batch of Almanac 2018, only 50 hectolitres have been bottled for this year’s release. The remainder will continue aging for another year, and will be blended with a portion of Almanac 2019 – an Imperial stout brewed this week for release next year – for a special vintage beer that will also be released on Cowbell’s 2nd anniversary. 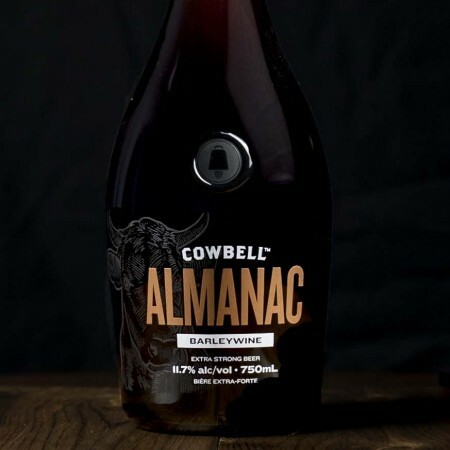 Almanac 2018 is available now in a limited run of 750 ml and 1.5 litre bottles exclusively at Cowbell while supplies last.